5/7/2014 - Fading posed an interesting question to me on Twitter: "Question: what tools does Green have to answer indestructable creatures? (Eldrazi)" and my answer being unsatisfying ("Being big enough to trample over or killing their caster first?") followed with "I have been thinking about it and I was wondering if there could be a reactive colorpie-following flavorful way to do it." Wither is the best, existing, common keyword appropriate to green that can answer indestructible. What if we made a new one? This ties into a similar ability this community talked about not too long ago. It's like an alternative to trample. Instead of applying "wasted damage" to the defending opponent, we use it to eat the smaller creature whole, which can negate death triggers and indestructibility. The +1/+1 counter isn't strictly necessary, but I think sells a mechanic many players will otherwise have no interest in. This is golden. I really like it, though not sure how often it should be there in common. I reminds me of engulfing slugworm. Wither is great too, but unfortunatelly goes in too few a sets. A rare enchantment with: Creatures tied for the highest power gain indestructable. Other creatures loose inderstructable. A targetted sorcery: Select a creature under your opponent's control. He sacrifies it, the reveals cards from the top of his library until he reveals a creature of higher CMC. He may put that creature into play. He shuffles his library. Enchant a creature you control. 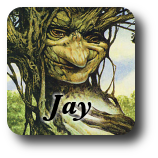 Creatures your opponents control loose all keyworded abilities that enchanted creature has. I really like the spirit of chomp, but I think it is too complicated as it is now. Imagine I attack my 4/4 with Chomp into your two 2/2s. You double block. What happens? If I'm smart, I assign 3 damage to the first blocker and 1 to the second. As damage is dealt, my creature takes 4 and gets a +1/+1 counter, one of your creatures is exiled, and one takes 1. My creature actually ends up living through the exchange (even though it is a 4/4 that takes 4 damage). I think there are a whole lot of very complicated things happening in this very simple example, and one can imagine much worse examples. Can we streamline this somehow so scenarios like this get more grokkable? Good points. On top of that, if players are playing correctly, it won't actually trigger except with combat tricks and chump blocking. That's often enough that I wouldn't veto the mechanic, but we have to watch out for player disappointment. I don't want another Sengir Vampire ability. Sengir vampire, with the introduction of fight, has become more interesting. Appart from that, it is true that the ability would need a bit of polishing. If we move away from this version, we should consider ENgulfing Slagwurm (http://magiccards.info/scans/en/som/118.jpg) as a base template, and add a slightly different trigger. If CARDNAME blocks or become blocked by one or more creatures with a total power lower than CARDNAME's, exile those creatures under CARDNAME. CARDNAME has +1/+1 for each creature exiled under it. Whenever ~ deals more damage to a creature than its toughness, exile it and put a +1/+1 counter on ~. Jules, note the same is true of first strike and death touch. We do want to avoid mechanics that will never do anything, but shaping play around that thing not happening can be good enough. 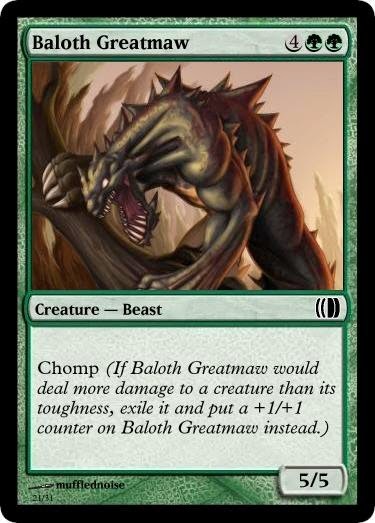 Target creature gets +1/+1 and gains chomp until EOT. They certainly have similar issues, but it's not as extreme. Your opponent often is willing to trade a good creature for something with deathtouch in the hope of keeping something better around later, and I've done my fair share of blocking 2/2 first strikers with pairs of 2/2s. It doesn't need to come up often, but it does need to come up. It may do that enough as is, I was just noting that we need to watch that carefully. Sengir Vampire was more obnoxious because Flying made the ability NEVER come up. So I was about to write a comment saying that using exile this way wasn't worth it and would just gum up the zone. Then I realized that the chomped creature gets exiled under Baloth Greatmaw, which is awesome. There are still some kinks to work out (mostly having to do with double-blocking either way), but I'm a fan of the idea. It's also a much nicer template for doing the Sengir Vampire thing (which is what this is in 90% of cases). Whenever CARDNAME blocks or is blocked by a creature, exile that creature and put a +1/+1 counter on CARDNAME. Or for humor points, some sort of 1/1 Simic gulper eel/bunny rabbit. If that's too far, Exiletouch may be the simplest implementation here (with or without the counter). Whenever CARDNAME blocks or is blocked by a creature with less toughness than its power, exile that creature and put a +1/+1 counter on CARDNAME. Or similar (less power than it, less toughness that it, etc), but that version gets across the eating a smaller guy thing. Anyone else has a different idea for a green mechanic that would be a suitable, colorpie adhering way for green to combat indestructable other than those presented above? Green gets access to Snakeform effects, for one thing. Indestructible itself is in green's color pie, and already serves as a good defense against indestructible. Yes indestructible is in Green, but it is usually at rare. Also it tends to create a stalemate without trample. As far as snakeform it is more in blue than in green. I would love it to be shifted more into green. Beast within destroyes. Perhaps a beast within that does not destroy but exile?